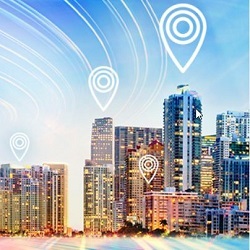 Map a more successful future with this latest edition of MapInfo Pro™. The Standard Edition 64-bit application provides analysts and business professionals with a robust solution to access more data, gain richer insight, and find the right answer with ease. This single-seat desktop license includes a one year Subscription and Services maintenance package, which provides you with access to any maintenance and upgrade releases, knowledge-base articles, access to the LI360 community web to share ideas and best practices and access to a world-class technical support team. Beta Tested - User Approved! 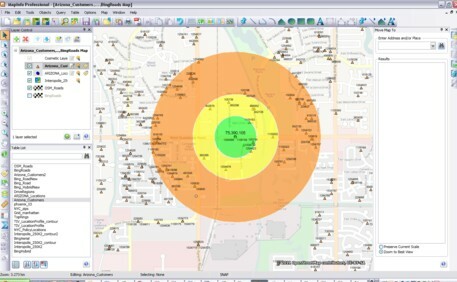 Take control of your spatial analysis. Enhanced in collaboration with users like you, MapInfo Pro™ v17 is stronger, smarter and simpler to use. Its user-inspired interface puts more power at your fingertips, so you can produce more compelling maps, more advanced analytics and drive better business outcomes. 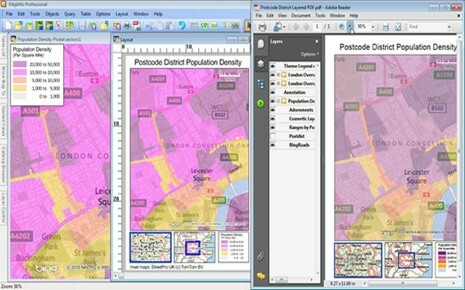 MapInfo Pro™ v17 enhancements are the result of an extensive collaboration with users like you. They'll help you surface relevant business insights by understanding the relationships between people, places and things. 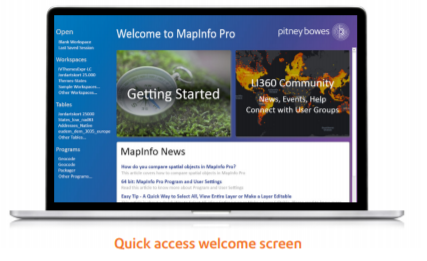 A new welcome screen gives you quick access to everything MapInfo Pro. With tips and tools to get you started and video tutorials to show you around, you'll quickly see what's new and better. Jump right into a sample workspace, pre-built and loaded with data so you can give v17 a test drive. Gain one-click access to your most recent files. Join the fast-growing LI360 User Community to share ideas and insights. It's all right there, right from the start. 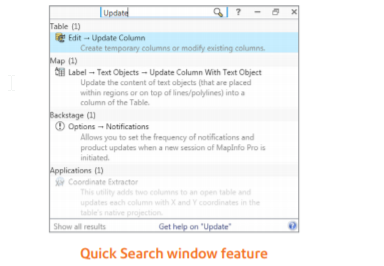 v17 Beta users report that the Quick Search window is their favorite new feature. When you type in what you are looking for, Quick Search shows you the corresponding commands on the navigation ribbon. It can even launch those commands for you. You'll quickly become familiar with the intuitive ribbon interface and its benefits. Quick Search shows you around without slowing you down. With customizable mini-toolbars, your most-used commands are just a right-click away. We've also added hot-key improvements and enhanced image quality. Thematic Mapping displays include intuitive drop-down menus. These allow you to change theme variables and turn ranges or values on and off with check-box ease. These user-friendly features will give you much greater flexibility and speed. Watch the video below to see how MapInfo Pro™ can transform your business. Microsoft Access (*.MDB and *.ACCDB) data format is also supported, including Access 2016.